Hi there! Today’s NOTD is about a recent nail fail. I didn’t like the polish and I also didn’t like the stamped images, so I didn’t even bother cleaning up around my nails properly. 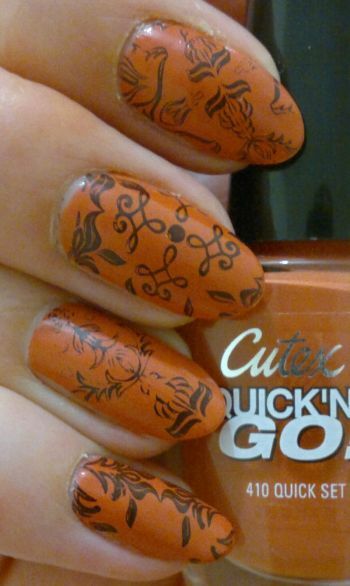 I painted my nails with two thin coats of Cutex Quick ‘N Go 410 Quick Set Coral. The polish was almost opaque in one coat – but just almost. The polish claims to dry in 45 seconds. Of course there is no polish that dries in such a short time. But I didn’t expect this polish to take ages to dry. It took, in fact, about 25 minutes (per coat) for the polish to dry. That was quite disappointing. Anyway, I then decided to stamp. I chose my JQ-L02 stamping plate which features several designs. The images look amazing on the stamping plate, but unfortunately I didn’t manage to transfer their amazingness onto my nails. That is, of course, my fault. So… the leafy image didn’t come out right on the pinky. The images on the ring finger and the middle finger came out wonky. And the image on the index finger is just… I don’t know… it doesn’t look right. Just in case you’re wondering, the black polish I used to stamp on the images was Maybelline MNY 677. Thanks for stopping by! I appreciate it.